Measure a cup of cold water and pour into the briki. If you want to make more cups, just fill the briki with as many cups of water as the cups of coffee you want. Place the briki on heat, either in ember or on a stove. 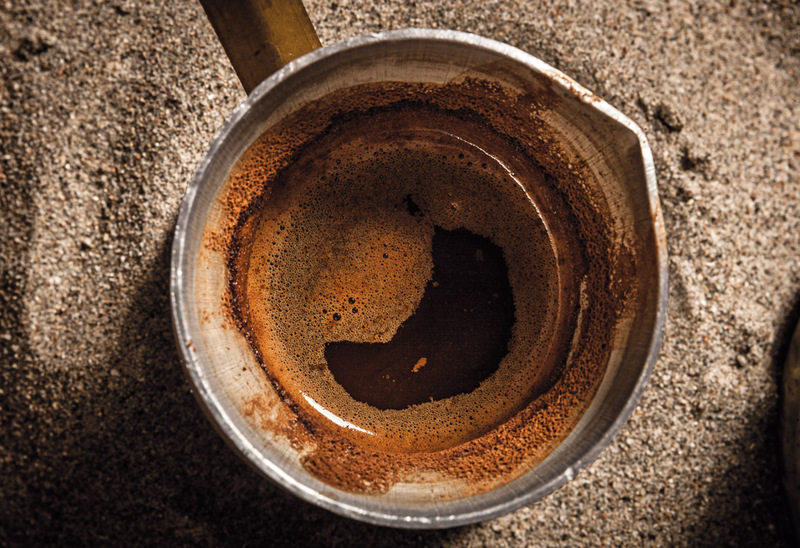 Add 1 heaping teaspoon of fine Greek Coffee and sugar to your heart’s content. Start stirring immediately until the grounds are well dissolved. Lower the heat and stay close; do not leave the coffee unattended. Foam will begin to form in the sides, moving toward the centre. Once it reaches the centre and begins rising, lift the briki from the heat to allow the bubbles to settle. Place it on heat again, for a few seconds. When it starts puffing up, remove it from heat. Carefully pour in the demitasse cup(s). If more than one is prepared, distribute the foam evenly. Serve it with a cold glass of water. You can accompany it with a koulouri (or a spoon sweet).